How Did College Highway Get Its Name? In early Southwick deeds, the main street was often spoken of as the Simsbury Road – or the road from Simsbury to Westfield. 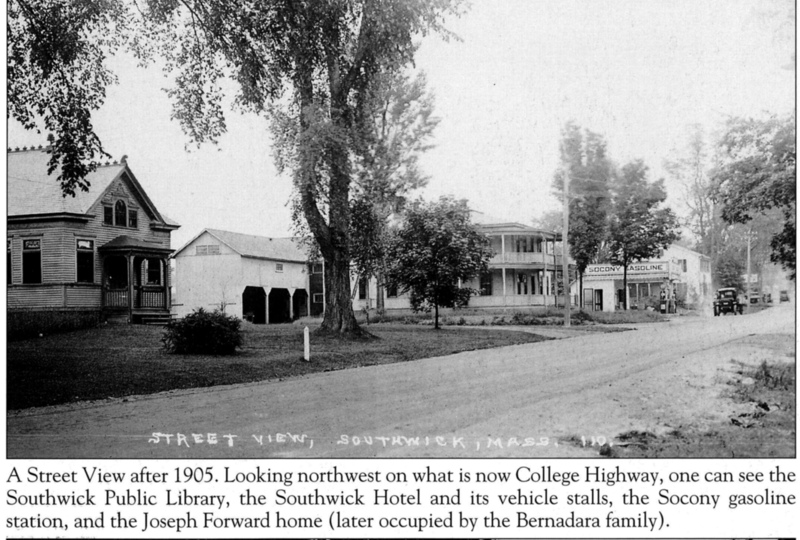 Sometimes it was called the “Turnpike.” Today Southwick has as good a road system as any town of its size in the vicinity. The main highway from north to south is called the “College Highway” – so named because there is a college at each end. There is Smith College in Northampton, Mass. and Yale in New Haven, Conn. Construction for this highway began about 1920. To reach Westfield after the days of fording the Westfield River were past, the Coles covered bridge was built and still was in use in 1890. To reach Springfield also a covered bridge over the Connecticut River was constructed. When discussion arose pertaining to the first bridge over the Connecticut at Springfield, a prominent citizen said, “Only a fool would even make a suggestion for a bridge at this point!” Isaac Damon built the bridge in 1820 and according to records of 1861 the old toll bridge at Springfield was charging twelve cents for toll. Both of these bridges were historic landmarks as long a they could stand the elements. There were built for protection from the weather from beast and man and were the scene of many “spooning” parties. In the early 1900’s both bridges were replaced by modern bridges. The complete “Historical Facts and Stories about Southwick” can be purchased at the Southwick Historical Society, 86-88 College Highway, Southwick, MA.